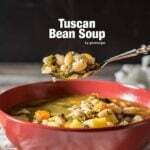 Tuscan Bean Soup is the best comforting meal on a chilly and rainy day. You will get warm even with the smell that fills your home. This is such a satisfying soup loaded with veggies and flavors that you don’t need anything else on your dinner table. Maybe just some drops of lime juice to add richness to the soup when serving. 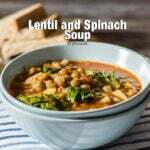 This Tuscan Bean Soup is a very quick one, it’s ready just in 30 minutes if you use canned beans or if you already have boiled beans in the freezer. If you want to cook beans from scratch though, soaking beans overnight would be the best before you start to cook them. It takes about 30 minutes to cook the raw beans if they are soaked for a good period of time beforehand. It takes way more time, maybe 2 hours if you directly put beans into the pot without soaking them. I mostly follow this method and don’t need canned beans. I cook about 2 pounds of beans at a time and then share it into bags to store in the freezer. Anyway, I assume you have cooked beans for this recipe; either canned or cooked by yourself. Other things you need are some really healthy winter veggies like carrot, spinach and celery, plus potatoes. I used spinach because I’m craving for it in almost all dishes these days, but you can use kale if you like it more. Although this soup could be made with chicken or beef stock, I made it vegan this time because our little one is allergic to beef and we didn’t have chicken stock on hand. I just used pure water also because I don’t think this Tuscan bean soup needs an additional flavor. It is quite flavorsome on its own due to the veggies in it. But it’s of course your choice to replace pure water with chicken or beef stock, whatever you like. In a large pot, heat olive oil and add onion and cook until golden. Add in other veggies and sprinkle black pepper and cumin over them. Stir well. Cook for 2-3 minutes stirring. If it gets too dry, just pour a little water to prevent sticking and stir. Toss in beans and pour hot water over them. Cook over medium high heat and bring to simmer. Reduce heat to medium low and cook partly covered for about 20 minutes so that all flavors combine well. Serve hot with a little extra black pepper and lime juice. I love this soup recipe! I followed the directions and it came out perfect! One of my favorite recipes! Glad o hear that Vanessa! One of our ultimate winter soups. Easy and full of nutritions. Totally bland. Tasted like water. Added garlic salt, pablano peppers, oregano, left over meat balls, thyme and simmered it for at least 45 min. and it ended up good. Topped it with cilantro, lime and a little cheese. How could I go wrong. Hi Will! Sorry to hear that your soup tastes bland. It is one of our favorites and we make it often during fall and winter. Not sure why yours doesn’t taste as good. Could that be because of the beans you use? I mean some beans might be really tasteless. I made this soup tonight and it was so delicious! The only thing is, I had to guess a few things. I’m rather a new cook and the directions never told me when to put in the garlic so I didn’t. Also, I wasn’t sure when to put in the potatoes ( are they one of the veggies?). I put the spinach in at the end, so it just wilted. When should I actually put in the garlic, salt and spinach, and potatoes. Thank you! Thank you Gloria for sharing your experience with the recipe! Will make those additions & corrections asap.